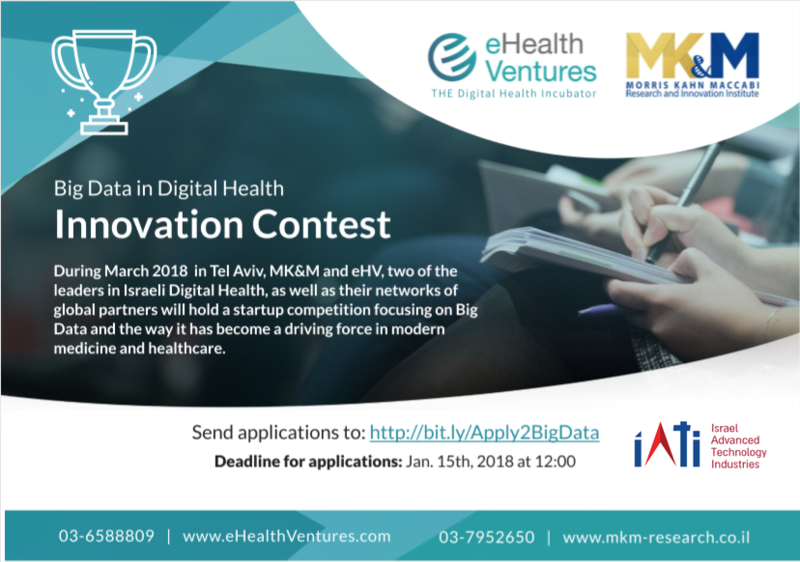 On March 20th in Tel-Aviv - The MK&M Research Institute and eHealth Ventures, two of the leaders in Israeli Digital Health, will hold a startup competition focusing on Big data, a driving force in modern medicine and healthcare. The topic is based on the role Big Data is playing within many of the disruptive and innovative startup companies and technologies that they are developing - all aimed at solving real clinical needs. The 5 finalists of the contest will present during the event, and compete for prizes which include a Term Sheet for an investment by eHealth Ventures (up to M 3 NIS), and a Service Agreement with MK&M including 250 medical consultation and data extraction hours, valued at 100 K NIS. • Exposure to MK&M and eHV management teams and multinational partners. • Finalists will present on stage to a “Shark Tank” of investor / partner / expert reps.
We invite all game-changing entrepreneurs, developing products / technologies / companies involving Big Data in Digital Health and aiming to change the way medicine will be delivered - to send us an application.